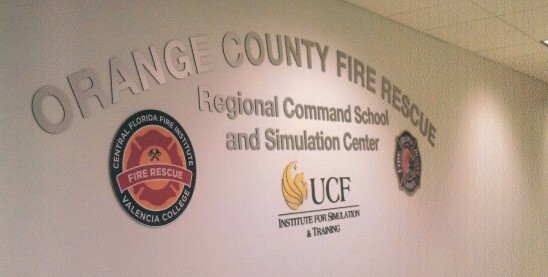 Orange County Fire Rescue Department’s new Regional Command School and Simulation Center, recently credited UCF’s Institute for Simulation & Training for the research efforts that helped make the school an effective source for training central Florida’s fire rescue incident commanders. IST’s logo shares space on the wall outside the new training center at Valencia College’s Criminal Justice Institute. Researchers in IST’s RAPTER Lab, headed by Ron Tarr, and E2i Creative Studio, headed by Eileen Smith, worked with OCRFD Division Chief of Training, Mike Wajda, and many of OCFRD’s Fire Officers to develop a new curriculum and simulation system to train on-scene fire commanders. Faced with a dwindling supply of veteran incident commanders—those officers who take charge at the scene of a fire or rescue emergency and direct the activities of fire/rescue crews—OCRFD sought the assistance of long-time training partner IST to improve the effectiveness of courses for incident commanders. The RAPTER Lab’s instructional designers revamped the curriculum and E2i Creative Studio’s software designers and digital artists developed the interactive graphic simulation that enables incident commanders-to-be to test their knowledge in different kinds of emergency situations. A FEMA grant to OCRFD funded the research and development. The center and new training curriculum were the result of “an incredible public, university and private agency cooperative team,” said RAPTER Lab Director Ron Tarr. Orlando offices of 3D perception Company provided the immersive visual display equipment used for the simulation. Since August 2013, OCFRD has run over 400 Incident Commanders through the program, with over 40 from surrounding counties.